I sure hope you like carbs! 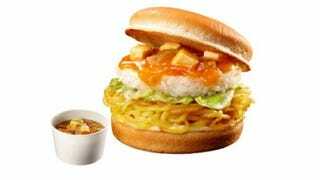 Lotteria, no stranger to odd burger stunts (here, here, here, and here), is releasing a hamburger that consists of white rice, lettuce, ramen noodles, and spicy tofu. Oh, and buns. Nico News reports that the burger, which comes with soup, is priced at 720 yen (US$6) goes on sale this month for a limited time. You can also order a side of flavored French fries! This is a collaboration between Lotteria, Tokyo ramen restaurant Mouko Tanmen Nakamoto, and carbohydrates.